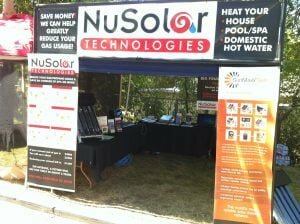 FOR IMMEDIATE RELEASE – Tuesday, October 23, 2012 – Auburn, California – SunMaxx Solar’s Regional Sales Manager, Nick Zebroff, once again successfully collaborated with Casey Clarke from NuSolar Technologies (certified SunMaxx dealer) at the Auburn Fall Home Show in Auburn, California from September 31 – October 2, 2012. During the Auburn Fall Home Show, Zebroff and Clarke spoke with over 150 interested patrons. Zebroff closed 3 systems from the home show and currently has 12 more appointments to discuss the solar-thermal system opportunities offered by SunMaxx further with potential clients this month. Although there were over 25 PV companies and 3 other Solar Thermal companies, SunMaxx Solar made a clear distinction over its competition due to our ability to heat DHW (Domestic Hot Water), space heating, pool heating, and spa heating all with one system. SunMaxx Solar is currently the only company with that sort of technology. With that said, local PV companies already began referring their customers to SunMaxx over our competitors. With SunMaxx Solar outreaching to the west coast, it is clear that SunMaxx is making a distinct impression on the region’s residents.